Welcome to the Web site for MySQL Cookbook, Second Edition. The most current printing is the Third Edition. The book covers techniques for solving many different SQL problems, and how to write your own MySQL programs using Perl, Ruby, PHP, Python, and Java. It is written in problem-and-solution format to make it easy for you to find the answers to your questions. It contains SQL-only recipes, command line scripts, and web scripts (using Apache for Perl, Ruby, PHP, and Python; and Tomcat for Java and JSP/JSTL). 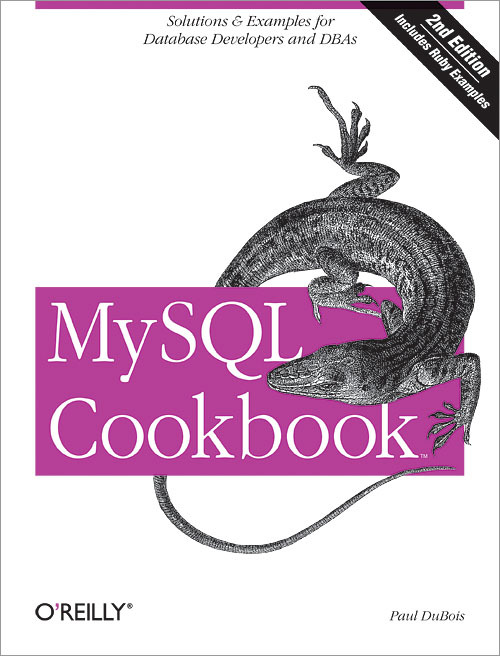 The second edition brings the recipes up to date for MySQL 5.0/5.1. For example, it covers views, stored routines, triggers, and events. The second edition also adds coverage for Ruby (using the Ruby DBI module). For PHP, the recipes now use the database-independent PEAR DB module rather than the MySQL-specific interface functions such as mysql_connect() and mysql_query(). Read this page in Finnish translation (by Design Contest).